Formed a rock band Asylum Suite in 1994, was produced by Fred Coury and Tom Keifer of the rock band Cinderella. Was signed to Southern Tracks Records in 1999. Toured the country with, Cheap Trick, Great White, Tesla, Firehouse, Brian Howe, Eddie Money too name a few. 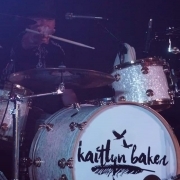 Now currently drumming for rising country artist KAITLYN BAKER.